If you keep the (good habit) of tagging Players, you can benefit from it during Campaign publishing. You can prevent Campaigns from being played on tagged players, or only publish to them. For instance, let’s say you are a digital signage provider and distribute advertisements within your network, which include different restaurant chains. It certainly would be a problem if you published a restaurant or fast food chain advertisement to the wrong establishment. 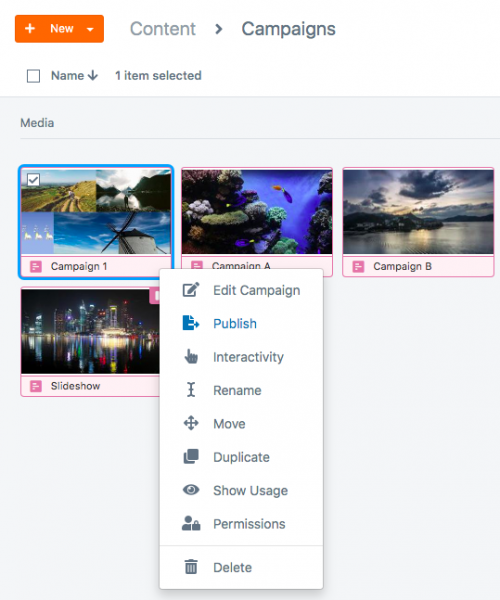 Right-click on the Campaign icon in the Campaign folder in your Content page and select “Publish”. Click “Publish to Player” on the top-right corner. Fill all preferences, including other publishing filters like time triggered playback or specific regions. Players which have these tags. If you select this filter, you can publish to as many Players as you want, but it will play back only on the devices which contain the tag you type into the box below. I could use this filter to prevent my menu board Campaign from playing at the wrong restaurant. This Campaign is a menu board for John’s Restaurant, not Mike's. So, I can insert a "John" tag to make sure it only plays on his screens. NOTE: If you add multiple tags, the playback will only work on devices which contain ALL tags together. Players which don't have these tags. 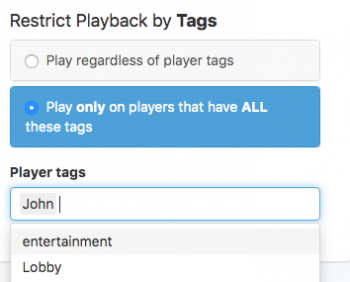 If I inserted Mike's tag instead of John's, but the Player does not have the tag, the Player will not play the Campaign. On the next page, the Players which received the Campaign will be listed. Those with the Campaign blocked due to a tag restriction will be marked. If you wish to remove this restriction, just click on the edit icon on the right and modify the filters.